The Singapore Wanton noodles was probably influenced by Hong Kong cuisine, but has become entrenched in our culture over the years. The Singapore version is typically eaten â€˜dryâ€™, drenched with some light sweet sauce, slices of pork char siew and wanton dumplings filled with pork, with a small bowl of soup on the side. Auntie will also ask if you want spicy or not. The spicy type sees chilli being mixed into the noodles, while the non-spicy kids version will have tomato sauce mixed in. Wanton dumplings may be either deep fried or come in soup dumplings. 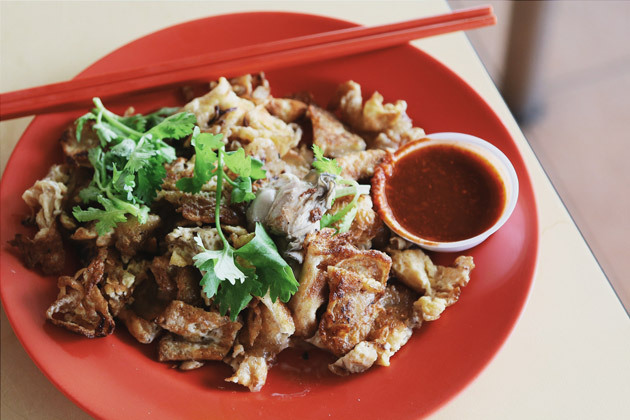 The Singapore Fried Carrot cake is made with eggs, preserved radish (chai poh) and white radish flour cake, which resembles a â€˜white carrotâ€™ and how the name comes about. 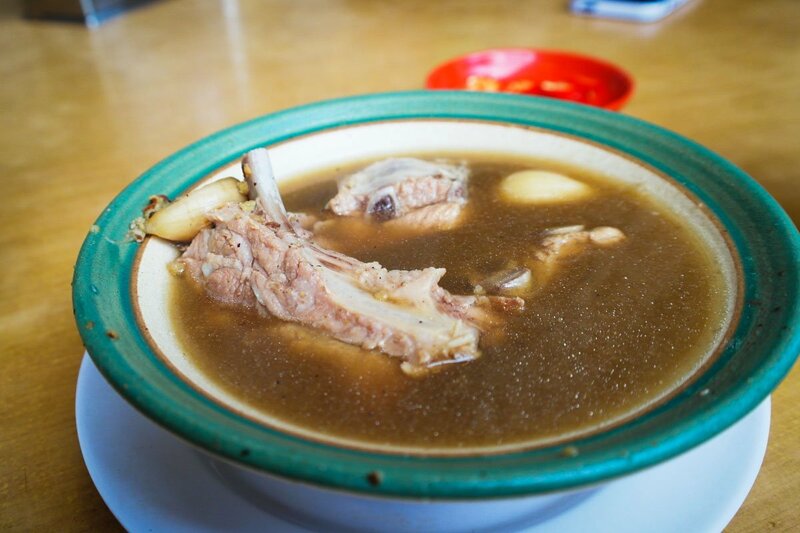 This is a teochew dish popular both in Singapore and Malaysia. Variants include the â€˜blackâ€™ version, which is with sweet sauce (molasses) added, or a crispy version with the cake fried on top of a beaten egg to create a crust and chunks of cake. Most commonly seen in Singapore though is the chopped up version with individual radish cake cubes. Another Hong Kong/ Shang Hai inspired type of dishes available in Singapore is the Dim Sum or â€˜Dian xinâ€™. This is not exactly 1 dish, but a set of small dishes to be savoured in a group- a typical Chinese dining sharing custom. 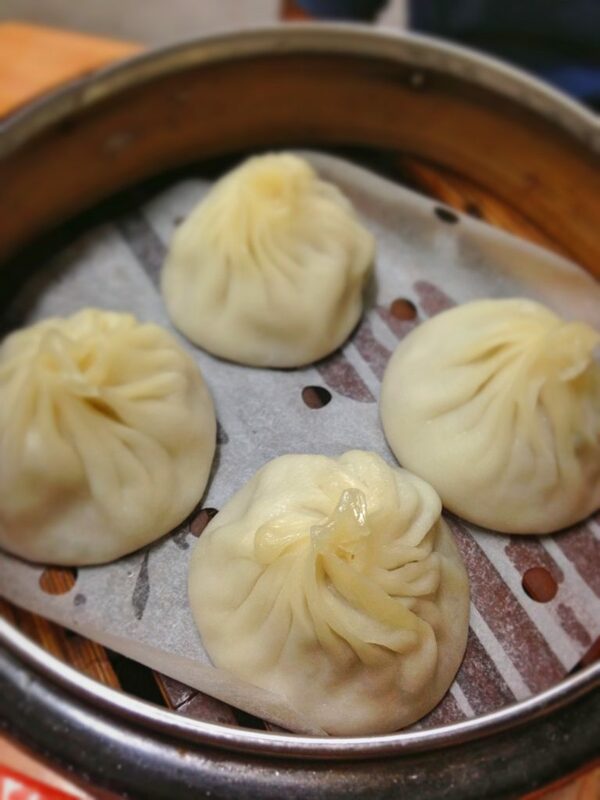 Popular dim sum dishes include the BBQ Pork Bun, Xiao Long Bao, Siew Mai, Chee Chong Fun and many more. 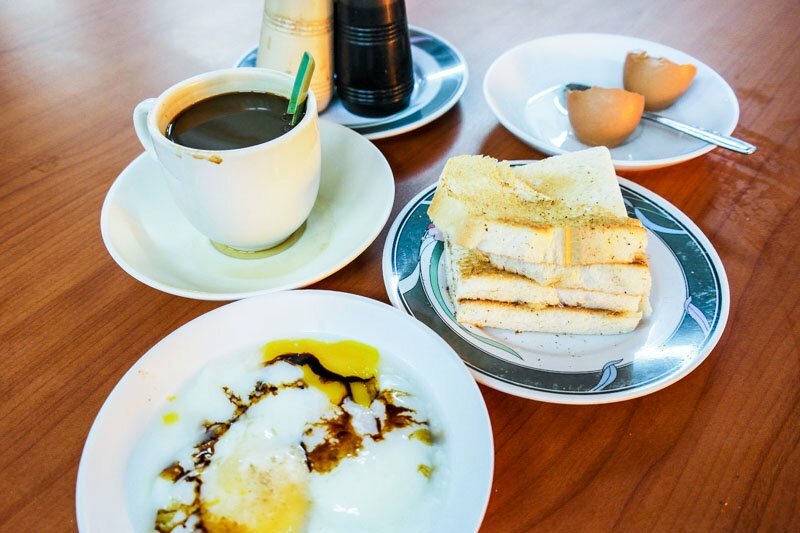 The one and only traditional Singaporean breakfast- Kaya toast with soft-boiled eggs. The traditional bread is an old school rectangular white loaf, toasted with a bread grill, lathered with coconut or egg kaya then slapped with a thick slice of SCS butter to slowly melt within 2 slices of warm bread. This is the classic kaya toast. Variations include using thinly sliced brown bread, round buns or â€˜Jiam Tao Loh Teeâ€™ like a French baguette. The 2 most famous styles of crab cooking in Singapore are with a sweet, spicy tomatoish chilli sauce, or with black pepper sauce. 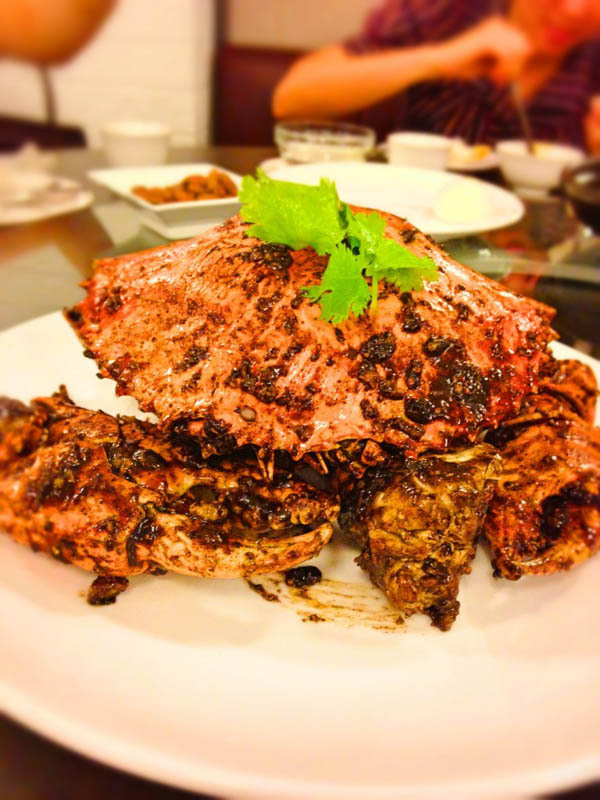 Chilli crabs are usually eaten along with fried mantous (buns), which are dipped in the luscious chilli sauce. Well prepared crabs go through a 2 step cooking process, boiled first then fried so that the meat doesnâ€™t stick to the shell. Recently, many popular styles of cooking have surfaced as well, like salted-egg crabs or crab bee hoon. Laksa is a dish merged from Chinese and Malay elements otherwise known as Peranakan culture. There are 2 main types of laksa- curry laksa and asam laksa. Curry laksa is more predominant in Singapore, while assam laksa is found more in Malaysian regions like Penang Laksa. In fact there loads of variants of Laksas differing in fish type, broth and even noodles. Traditional Singapore Curry Laksa uses vermicelli, coconut milk, tau pokÂ (beancurd puffs), fish slices, shrimp and cockles (hum). A unique Singapore variant known as Katong Laksa has itâ€™s vermicelli cut into short ends and is eaten only with a spoon. 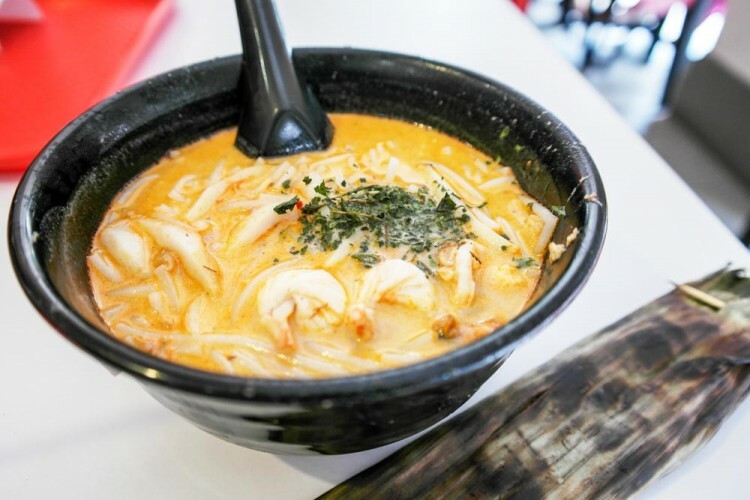 There is much debate on who is the original Katong Laksa. Is it Chinese, Indian or Malay? This is another ambiguous dish with probably a South Indian origin, but heavily influenced by the various ethnicities in Singapore. What I do know, is that itâ€™s delicious. 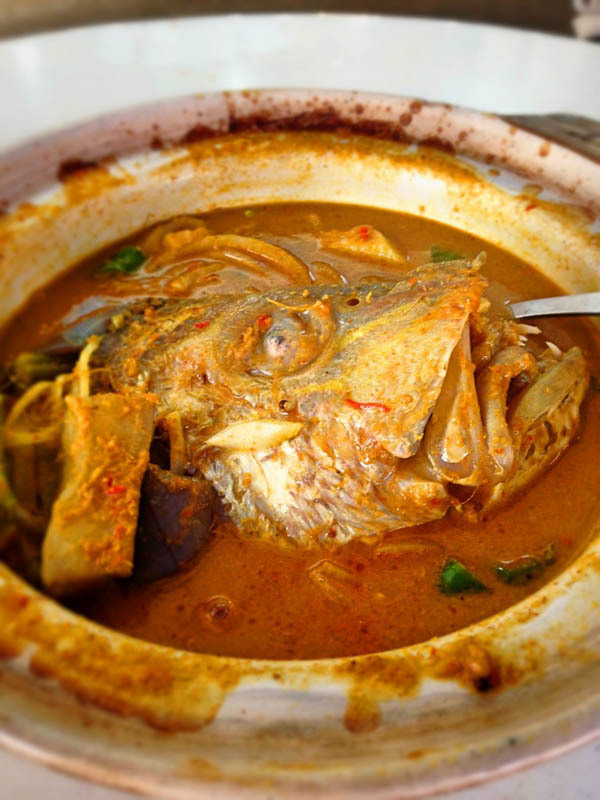 Either half a head or the whole head of a Red snapper is stewed in curry with assorted vegetables like Ladyâ€™s Finger (okra) and brinjal. The Indian style of curry has heavier spices and flavours, while the Chinese styles are lighter and sweeter.Variants include the Assam style fish head curry, which adds in a tinge of sourness with Tamarind fruit (assam). Colloquially known as â€˜Bak Chor Meeâ€™Â è‚‰è„žé¢, this is a noodle dish with minced pork, liver, meat balls/ fish balls, fish cake slices and a signature vinegar braised sauce that adds some wetness. Typically, the dish is ordered â€˜dryâ€™ to savour full flavours of the sauce and you can choose between chilli or ketchup, and the type of noodle to use. 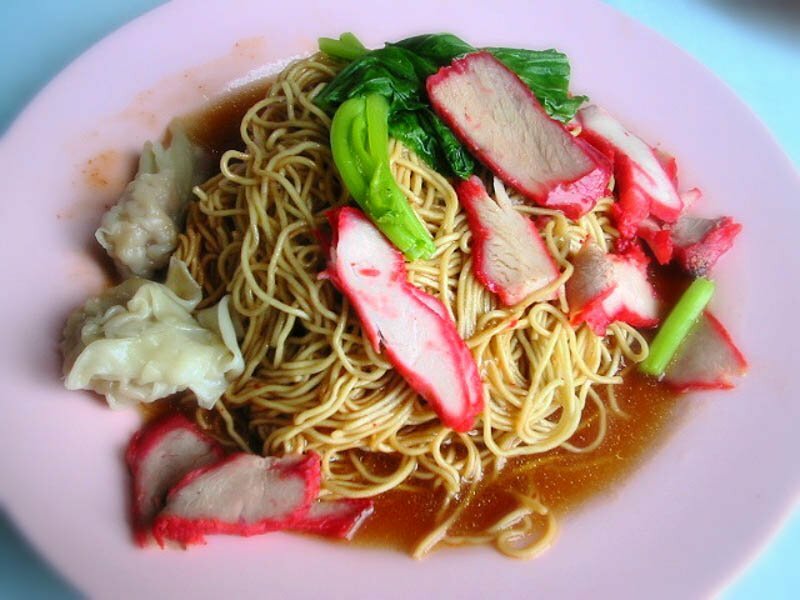 Noodle choices are normally either Mee Pok (a flat noodle) or Mee Kia (thin noodle), while some stalls offer bee hoon, mee sua or mee tai mak as well. 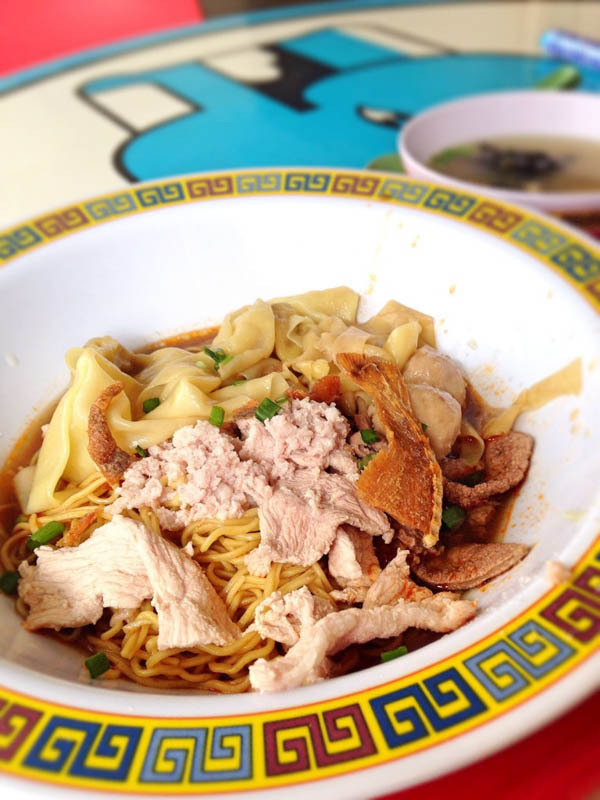 Variants include an exclusively soup version with home-made noodles famous at Bedok Blk 85. A dish popular in Singapore Hawkers as well as Taiwan Night markets, this is a dish many foreigners and locals love. Stalls that sell carrot cake typically also sell Oyster omelettes as itâ€™s a similar cooking process as well as utilizing a common ingredient: Eggs. Potato starch is usually mixed into frying the egg and gives a thicker, fuller taste. Variants include a version without the starch, which is priced slightly higher due to more eggs needed instead. A special vinegar chilli is also paired exclusively with oyster omelettes in Singapore. The Singapore Hokkien Mee fries a combination of egg noodles and rice noodles in a rich prawn stock with cubes of fried pork fat, prawns, fish cake and squid. Some vendors add pork strips as well to add more flavour. 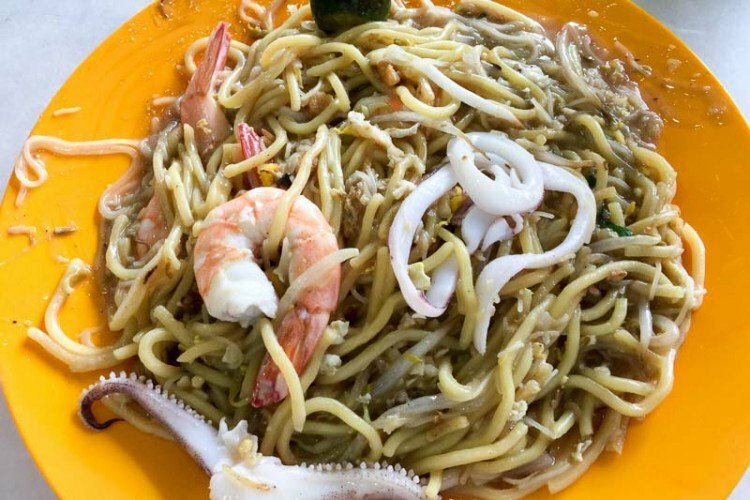 This dish was a product of post-war Hokkien noodle factory workers who would gather along Rochor road and fry any excess noodles they had. Another version easily confused by the same name is called the Hokkien Char mee, which is covered in a signature thick dark sauce and uses only 1 type of egg noodle. Satay is a dish of skewered, Turmeric marinated meat that is grilled on an open fire. It originates from Indonesia but has become a common hawker fare in Singapore. Stalls are not restricted to any race and may be operated by Chinese, Malays or Indians. Typical meats include chicken, beef, mutton and even pork which is sold by the Chinese stall owners. 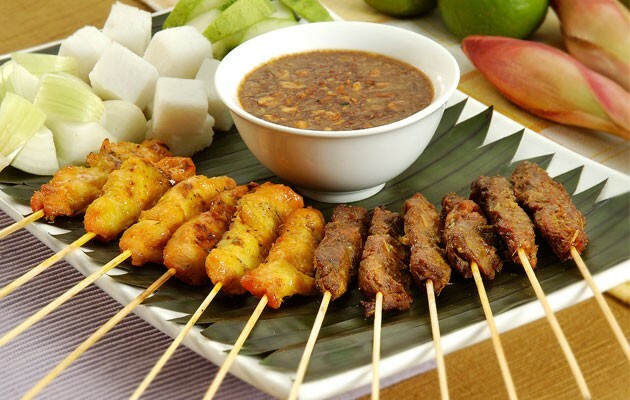 Ketupat (rice cake), onions and cucumbers usually accompanies Satay. A spicy peanut dip is also provided for the Satay and sides as well. In the past, having a fridge/freezer was as rare as winning Toto; Barbecuing or frying fishes to musk the fishy odour after being left out in the open for days was a popular cooking choice. 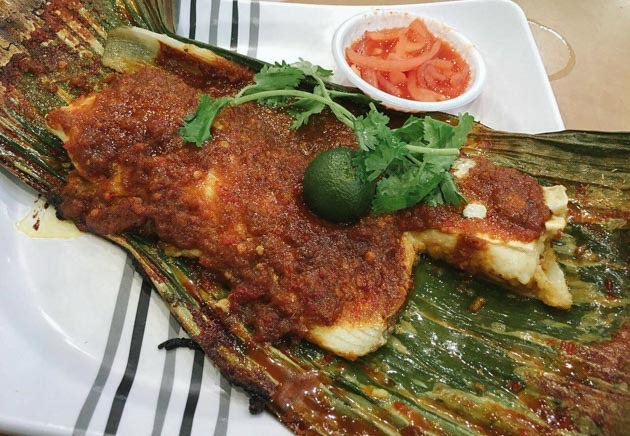 Also known as Ikan Bakar (barbequed fish), Stingray used to be unpopular but has risen in price since Singaporean Malays figured out that Sambal on top of Sting Ray = delicious. It is traditionally wrapped in banana leaf and barbecued, then a sambal paste made with belachan, spices, shallots and Indian walnuts is smothered generously all over the top. Lime is usually squeezed in right before eating as well. Tau Huay is a Chinese dessert made with beancurd tofu that is sweetened with sugar syrup. The traditional type is very soft, slightly grainy and soaks in syrup to be eaten together. This Tau Huay can be eaten hot or cold, sometimes with Tang Yuan, grass jelly or Soya bean milk added as well. 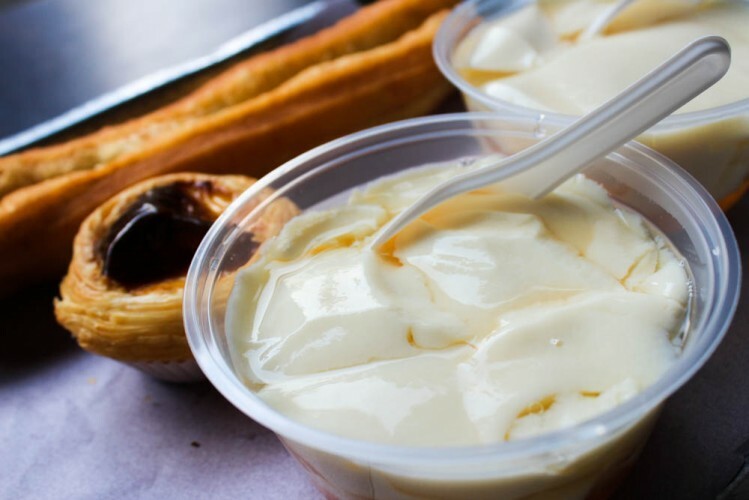 In recent times, a popular more gelatine, jelly-like version of Tau Huay has surfaced and for a period, drove Singaporeans to queue like ants to sugar. This version is smoother and can incorporate pretty much any flavour like mango, melon or sesame. The texture is distinctively different from the traditional types and some camps advocate against it due to unnatural stabilizers used. This is eaten cold as heat would break the structure. 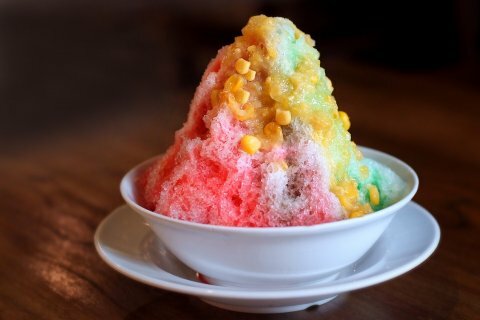 A grinding machine is used to produce the shaved ice mountain on top of a bowl of assorted ingredients like red bean, attap chee (palm seed), agar agar jelly, chendol, grass jelly or any other filling desired. Evaporated or condensed milk is then drizzled on the top along with red rose syrup and sarsi syrup to produce the multi-coloured effect. Variations may include drizzling with gula melaka, adding ice-cream or other novelty toppings like Durian or chocolate syrup. Another breakfast dish seen regularly in Singapore and Johor, most stalls only open in the morning and close by lunch. Rice flour and water are mixed together to form the rice cake, then put into little saucers and steamed to produce the typical Chwee Kway bowl-like shape. 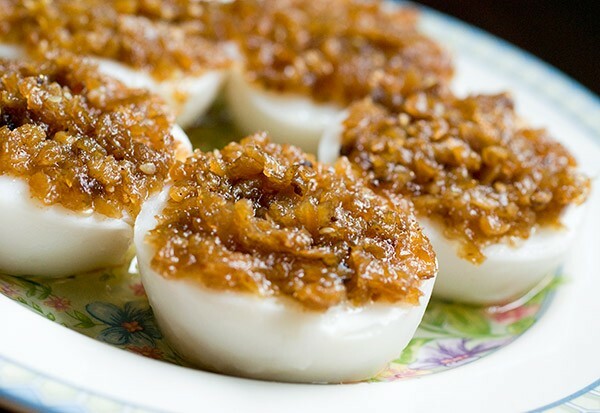 It is topped with chai poh (preserved radish)Â and chilli. Chwee kway is a dying trade that the young generation does not want to carry on, so try it before its gone forever. Biryani is a fried rice dish of Indian Muslim influence made using distinctive long grain rice, usually with Basmati rice. 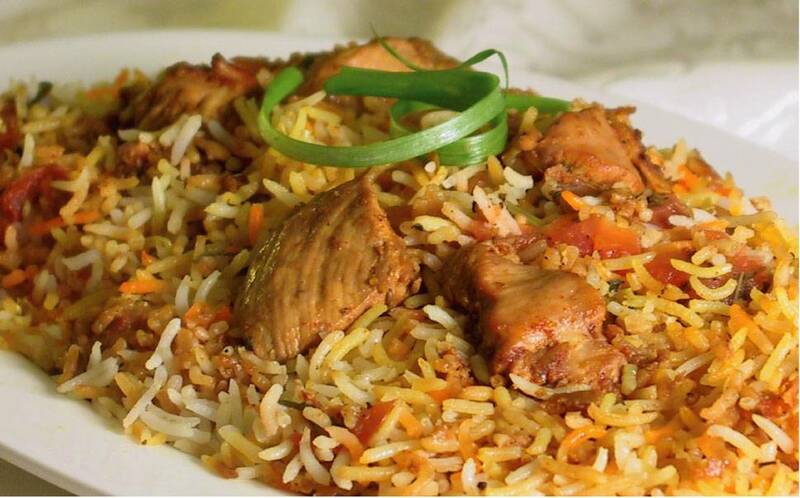 Meats can be added to make it a Chicken, beef or fish Biryani. Spices used are also heavy in flavour like cinnamon, cloves, nutmeg and bay leaves. The resulting rice grains is usually very dry and can be accompanied by curry or chutney. Nasi Lemak is a very versatile dish and what was once a breakfast item, is now eaten during lunch and dinner too. Traditionally wrapped in banana leaves, Nasi Lemak is a deeply rooted Malay coconut rice dish. The rice is steamed with coconut cream to give it a sweet fragrance. 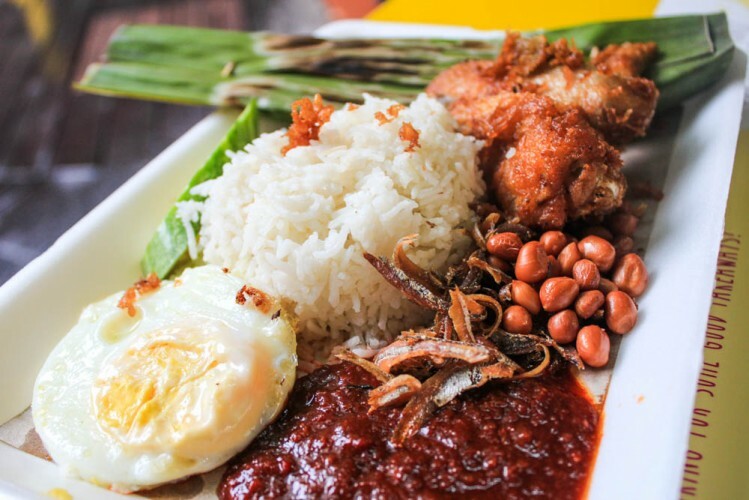 The typical Nasi Lemak set comes with Ikan Bilis (anchovies), peanuts, egg and sambal. A good sambal is arguably the mark of a good Nasi Lemak. Nasi Lemak is so popular in Singapore, the other races have adopted Nasi Lemak in their own variations of the dish and offer a wide selection of ingredients like fried chicken drumsticks, luncheon meat and sotong balls. 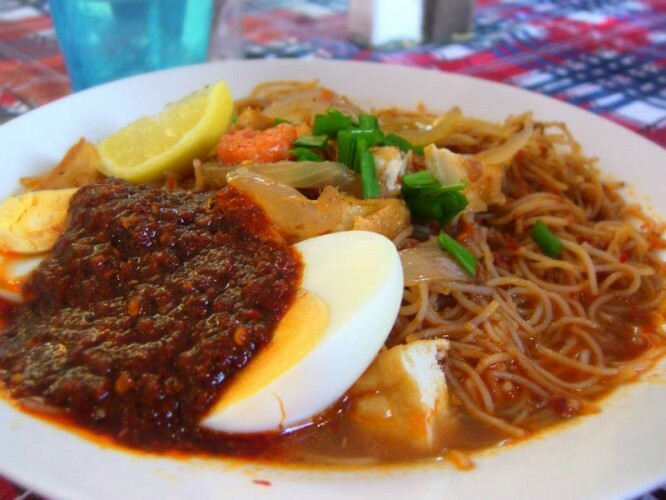 Popular among the Muslim community as well as Chinese, Mee Siam has been absorbed into Singaporeâ€™s Nonya culture. Mee Siam means â€œSiamese noodlesâ€ and is vermicelli soaked in a sweet and spicy gravy flavoured by Tamarind (assam), dried shrimp and Tau Cheo (fermented bean paste). 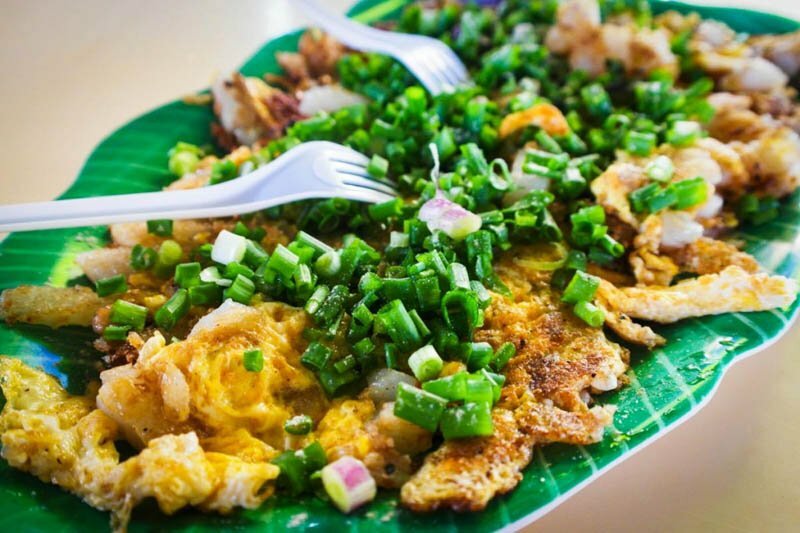 Â It usually comes with a boiled egg, bean sprouts, tau pok (beancurd puff) and is garnished with chives.